Grown in Hawaii, very fresh and usually shipped to you within 48 hours of harvest. At this time we are offering really fragrant, delicate turmeric with nice light color, light tips, and deep orange internal color as shown. Turmeric is revered for it's well-known beneficial health properties, and is a wonderful natural yellow food coloring for not just Thai food--it's widely used around the world. 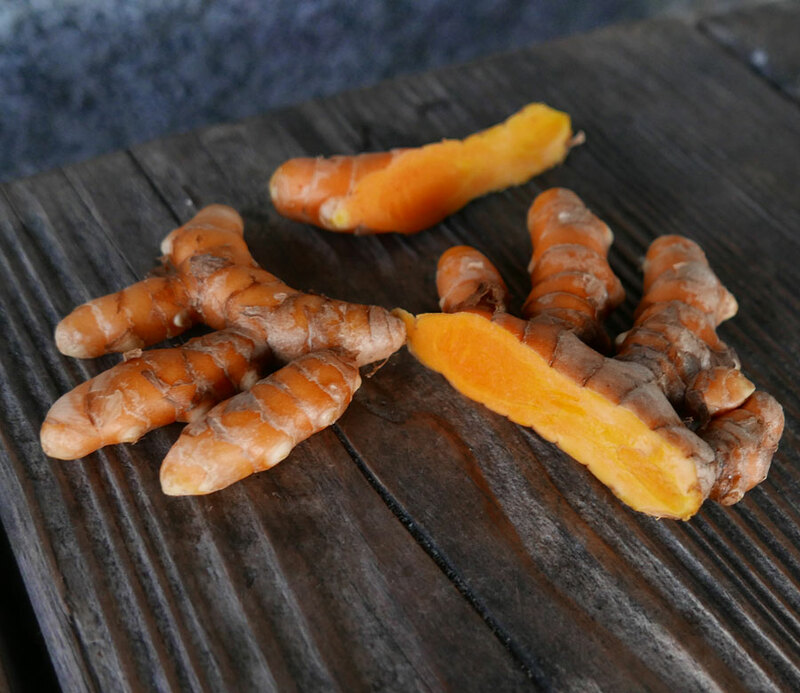 We're happy to share our new shipment of fresh turmeric, grown in Hawaii, it's as good as it gets. Fresh harvest turmeric has beautiful natural color, with has a wonderful earthy aroma, and mild flavor. Shipping a generous 12 oz portion, about 3 times the quantity in picture. The price includes Priority 2-3 day shipping and will arrive in ideal condition. We ship fresh turmeric via Priority Mail, quick delivery within 2-3 days straight to your mailbox. The price includes priority shipping. More common in Thailand, especially in health spas, is a simple tea made using fresh lemongrass. Please Note: Fresh turmeric ships via USPS Priority Mail so please provide an address that can be used for USPS delivery. If you order only fresh produce, select "$0.00" as shipping charge at checkout (because the price above includes express shipping). If you order fresh produce and any other items, you must checkout with "Fedex Ground" as the shipping method, and you will receive the other items separately. Occasional delays due to Mother Nature & harvest conditions. Any questions about shipping, if you need a definite delivery date, delivery times, or anything else please feel free to call toll free 888-618-THAI.